The below artworks are the most important by Wassily Kandinsky - that both overview the major creative periods, and highlight the greatest achievements by the artist. Artwork description & Analysis: This breakthrough work is a deceptively simple image - a lone rider racing across a landscape - yet it represented a decisive moment in Kandinsky's developing style. In this painting, he demonstrated a clear stylistic link to the work of the Impressionists, like Claude Monet, particularly evident in the contrasts of light and dark on the sun-dappled hillside. The ambiguity of the form of the figure on horseback rendered in a variety of colors that almost blend together foreshadow his interest in abstraction. The theme of the horse and rider reappeared in many of his later works. For Kandinsky this motif signified his resistance against conventional aesthetic values as well as the possibilities for a purer, more spiritual life through art. 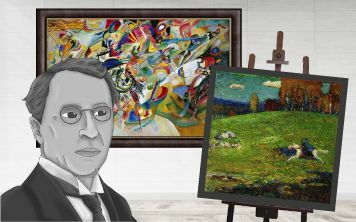 Artwork description & Analysis: In this work, the influence of the Fauves on Kandinsky's color palette is apparent as he distorted colors and moved away from the natural world. He presented a bright blue mountain, framed by a red and yellow tree on either side. In the foreground, riders on horseback charge through the scene. At this stage in Kandinsky's career, Saint John's Book of Revelation became a major literary source for his art, and the riders signify the four horsemen of the apocalypse. The horsemen, although an indicator of the mass destruction of the apocalypse, also represent the potential for redemption afterward. Artwork description & Analysis: Hidden within the bright swaths of color and the clear black lines of Composition IV, Kandinsky portrayed several Cossacks with lances, as well as boats, reclining figures, and a castle on a hilltop. As with many paintings from this period, he represented the apocalyptic battle that would lead to eternal peace. The notion of battle is conveyed by the Cossacks, while the calm of the flowing forms and reclining figures on the right alludes to the peace and redemption to follow. In order to facilitate his development of a non-objective style of painting, as described in his text Concerning the Spiritual in Art (1912), Kandinsky reduced objects to pictographic symbols. Through his elimination of most references to the outside world, Kandinsky expressed his vision in a more universal manner, distilling the spiritual essence of the subject through these forms into a visual vocabulary. Many of these symbolic figures were repeated and refined in later works, becoming further and further abstracted as Kandinsky developed his mature, purely abstract style. Artwork description & Analysis: Commonly cited as the pinnacle of Kandinsky's pre-World War I achievement, Composition VII shows the artist's rejection of pictorial representation through a swirling hurricane of colors and shapes. The operatic and tumultuous roiling of forms around the canvas exemplifies Kandinsky's belief that painting could evoke sounds the way music called to mind certain colors and forms. Even the title, Composition VII, aligned with his interest in the intertwining of the musical with the visual and emphasized Kandinsky's non-representational focus in this work. As the different colors and symbols spiral around each other, Kandinsky eliminated traditional references to depth and laid bare the different abstracted glyphs in order to communicate deeper themes and emotions common to all cultures and viewers. Artwork description & Analysis: At first the move to Moscow in 1914 initiated a period of depression and Kandinsky hardly even painted at all his first year back. When he picked up his paintbrush again in 1916, he expressed his desire to paint a portrait of Moscow in a letter to his former companion, Munter. Although he continued to refine his abstraction, he represented the city's monuments in this painting and captured the spirit of the city. Kandinsky painted the landmarks in a circular fashion as if he had stood in the center of Red Square, turned in a circle, and caught them all swirling about him. Although he refers to the outside world in this painting, he maintained his commitment to the synesthesia of color, sound, and spiritual expression in art. Kandinsky wrote that he particularly loved sunset in Moscow because it was "the final chord of a symphony which develop[ed] in every tone a high life that force[d] all of Moscow to resound like the fortissimo of a huge orchestra." Artwork description & Analysis: The rational, geometric order of Composition VIII is a polar opposite of the operatic composition of Composition VII (1913). Painted while he taught at the Bauhaus, this work illustrates how Kandinsky synthesized elements from Suprematism, Constructivism, and the school's own ethos. By combining aspects of all three movements, he arrived at the flat planes of color and the clear, linear quality seen in this work. Form, as opposed to color, structured the painting in a dynamic balance that pulses throughout the canvas. This work is an expression of Kandinsky's clarified ideas about modern, non-objective art, particularly the significance of shapes like triangles, circles, and the checkerboard. Kandinsky relied upon a hard-edged style to communicate the deeper content of his work for the rest of his career. Artwork description & Analysis: Kandinsky painted this work in his sixtieth year and it demonstrates his lifelong search for the ideal form of spiritual expression in art. Created as part of his experimentation with a linear style of painting, this work shows his interest in the form of the circle. "The circle," claimed Kandinsky, "is the synthesis of the greatest oppositions. It combines the concentric and the eccentric in a single form and in equilibrium. Of the three primary forms, it points most clearly to the fourth dimension." He relied upon the varied possibilities of interpretation for the circle to create a sense of spiritual and emotional harmony in this work. The diverse dimensions and bright hues of each circle bubble up through the canvas and are balanced through Kandinsky's careful juxtapositions of proportion and color. The dynamic movement of the round forms evokes their universality - from the stars in the cosmos to drops of dew; the circle a shape integral to life. Artwork description & Analysis: Influenced by the flowing biomorphic forms of Surrealism, Kandinsky later incorporated organic shapes back into his pictorial vocabulary. Executed in France, this monumental painting relies upon a black background to heighten the visual impact of the brightly colored undulating forms in the foreground. The presence of the black expanse is significant, as Kandinsky only used the color sparingly; it is evocative of the cosmos as well as the darkness at the end of life. The undulating planes of color call to mind microscopic organisms, but also express the inner emotional and spiritual feelings Kandinsky experienced near the end of his life. The uplifting organization of forms in contrast with the harsh edges and black background illustrates the harmony and tension present throughout the universe, as well as the rise and fall of the cycle of life. Last in his lifelong series of Compositions, this work is the culmination of Kandinsky's investigation into the purity of form and expression through nonrepresentational painting.